The thermally-dimorphic systemic fungal group includes several important human pathogens: Blastomyces dermatitides, Coccidioides immitis and C. posadasii, Histoplasma capsulatum, Paracoccidioides brasiliensis, P. lutzii, and Talaromyces (Penicillium) marneffei. They usually are geographically restricted and have natural habitats in soil or in plants, and when fungal propagules invade mammalian host by inhalation, they initiate an inflammatory reaction that can result in self-resolution of the infection or cause an acute or chronic disease. In the setting of the AIDS pandemic and the developments in modern medicine, such as immunosuppressive therapy in cancer surgery patients and in transplantation and autoimmune diseases, the incidence of endemic mycoses has progressively increased. Another important factor of the increased incidence of systemic mycoses in certain regions is the progressive devastation of tropical and subtropical forests. In this review, we focus on two of the most important systemic mycoses: paracoccidioidomycosis and histoplasmosis, and their major characteristics in epidemiology, clinical aspects and laboratorial diagnosis. Keywords: Chronic disease, Histoplasmosis, Infection, Paracoccidioidomycosis, AIDs, Penicillium. Keywords:Chronic disease, Histoplasmosis, Infection, Paracoccidioidomycosis, AIDs, Penicillium. Abstract:The thermally-dimorphic systemic fungal group includes several important human pathogens: Blastomyces dermatitides, Coccidioides immitis and C. posadasii, Histoplasma capsulatum, Paracoccidioides brasiliensis, P. lutzii, and Talaromyces (Penicillium) marneffei. They usually are geographically restricted and have natural habitats in soil or in plants, and when fungal propagules invade mammalian host by inhalation, they initiate an inflammatory reaction that can result in self-resolution of the infection or cause an acute or chronic disease. In the setting of the AIDS pandemic and the developments in modern medicine, such as immunosuppressive therapy in cancer surgery patients and in transplantation and autoimmune diseases, the incidence of endemic mycoses has progressively increased. Another important factor of the increased incidence of systemic mycoses in certain regions is the progressive devastation of tropical and subtropical forests. 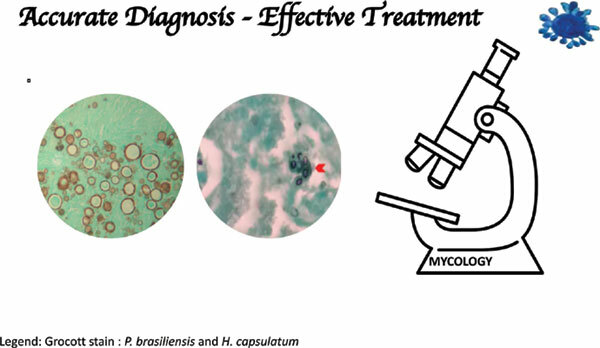 In this review, we focus on two of the most important systemic mycoses: paracoccidioidomycosis and histoplasmosis, and their major characteristics in epidemiology, clinical aspects and laboratorial diagnosis.